If you have decided that you want different size implants after receiving a previous breast augmentation procedure, you may want to consider the breast implant revision procedure. There is no need to worry about receiving additional incisions since the implant can be removed through the previous incision and can be replaced with a different sized implant in the same pocket as before. This procedure of removal and replacement is done under general anesthesia, like most other procedures of its nature, and it is completely safe for the patient to return home the same day. Over time, we all start to see visible signs of aging on our skin such as wrinkles, lines, and creases, which seem to grow in size and number as the years pass. Luckily, there is a way to fight back. We treat the visible signs of aging with procedures such as a rhytidectomy, more popularly known as a facelift, which gives our patients a younger, rejuvenated look and feel. 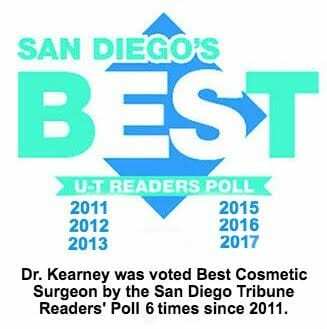 People who have wrinkles, sagging skin and those who have lost their skin elasticity are good candidates for this procedure and are recommended to consult Dr. Kearney for more details. If you appear tired all the time, it may be the cause of excess skin beneath the eye or sagging eyelids. This can affect your vision and give the impression that you are older than you really are. A blepharoplasty, also known as the eyelid lift, is a surgical procedure, which can improve the appearance of the eyelids and revive the section around the eyes. During this procedure, a small incision is made in the natural folds of the eyelids and excess fat is removed through this incision. Contact us today at 858-677-9352 to schedule your consultation.